Maintenance has been done, that is why we are low on funds. We'll see. Right now that is not a need right now item. Especially since our budget is really tight right now. Maybe, it's not a 4x4. 2001 Dodge Durango xlt. Got it for 2700 with 195,000 miles on it. Has the infinity sound system but that will be replaced. we get our own rust down here in the south with all the saltwater. Cool.. I had an 82 D150 when I moved down to FLorida in 2008. 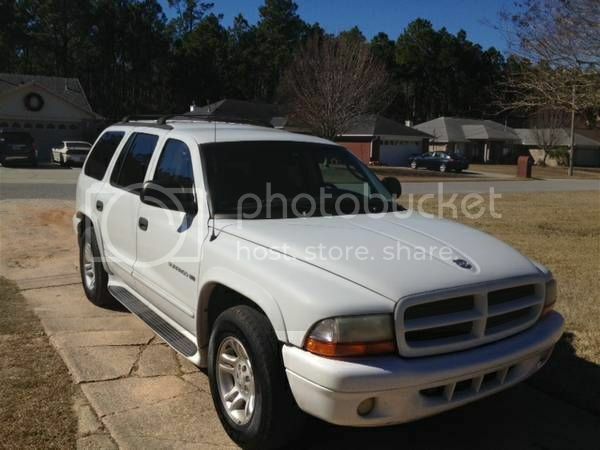 On another note, we will be the owners of a 2001 dodge Durango that we are getting for under 3 grand. 04 Dakota quad cab we were looking at getting was sold. Topic: Please lock this thread. Can a mod delete or lock this up? And since my neon was taken because of flood damage I am looking into getting a quad cab Dakota. So I found the truck I want to replace the neon that was flooded. 2004 Dodge Dakota club cab. I checked it out and I am happy with it. Only problem is my family is like everyone else, short on funds. Anyone want to donate around 5 grand? So many members on we here maybe should have a pinned thread that is just birthdays. Awesome to hear about y'all having twins. They will be a handful but you both will enjoy every second. GLWS. You could pry up the rear deck but you would have to be careful not to bend it too far and break it. That is how I did it when I replaced mine when I had my 03. Better late than never. Happy Belated birthday OD. Lane, I am trying not to give up. Even though I almost crashed the van on Saturday coming back from playing paintball. And David, thank you for that. I know you would if you could. If I could only raise $4500. There is a black srt 4 in Dothan, AL. Admins can you lock this up or delete it? Unless some miracle happens, I won't be able to get an srt4 for at least 4 years.